S I N C E P A R A C E L S U S (1493-1541), salt has played a role in alchemy as the physical “body” which remains after combustion, the corporeal substance that survives death to reinaugurate new life. It was both ‘corruption and preservation against corruption’ (Dorn); both the ‘last agent of corruption’ and the ‘first agent in generation’ (Steeb). As such, the alchemical salt functions as the fulcrum of death and revivification. The idea that the agent, instrument and patient of the alchemical process are not separate entities but aspects of one reality prefigures the significance accorded in this study to ‘the Hermetic problem of salt’. Just as in chemistry a salt may be defined as the product of an acid and a base, alchemically, salt is the integral resolution to the primordial polarities embodied in the mineral symbolique of cinnabar (HgS), the salt of sulphur and mercury. In the alchemy of René Adolphe Schwaller de Lubicz (1887-1961), salt forms the equilibrium between an active function (sulphur, divinity, peras) and its passive resistance (mercurial substance, prima materia, the apeiron), aspects which are latently present in the primordial (pre-polarised) unity, but crystallised into physical existence as “salt”. With Schwaller’s concept, one is dealing with a juncture of the metaphysical and proto-physical. As will be seen, however, this also inheres in the body as a fulcrum point of death and palingenesis. ‘Salt arises from the purest sources, the sun and the sea’. In addition to its salvific, balsamic and holistic aspect, which must be regarded as the meaning most central to the alchemical perception, the significance of salt as both ‘leap’ and ‘solidity’ must also be recognised as integral. In particular, it pertains to Schwaller’s conception of salt as the fixed imperishable nucleus (solidus) regarded as the hidden mechanism underpinning the ontological ‘leaps’ or mutations of visible evolution (contra the Aristotelian dictum, natura non facit saltum, ‘nature does not proceed by a leap’). For Schwaller, the seemingly disconnected leaps of biological mutation are in fact bound by a hidden harmony grounded in the saline alchemical nucleus. Commodity histories show that salt was not always the easily available resource it is today; it had to be striven for; it required effort and ingenuity (perhaps even wit). It created trade and war; it was used as pay and exploited as a tax. Nor did salt have the current stigma of being an unhealthy excess (a problem symptomatic of modern surfeit). Quite to the contrary, salt was typically a sign of privilege and prestige. ‘Salt like speech is essentially semiotic’, Adshead remarks; ‘As such it could convey a variety of meanings, of which the clearest in early times was social distance: high cooking, low cooking, above and below the salt’. Considerations such as these help contextualise many of the ancient values surrounding salt, some of which have become proverbial. In the New Testament, for instance, but also elsewhere, the sharing of salt (often with bread at a table), represented a deep bond of trust, of communal solidarity, while the spilling of it was considered a grave faux pas. Indeed, if salt was as freely available for liberal exploitation as it is today, such ethical and social implications would scarcely carry any weight at all. Most of salt’s social meanings reflect its deepest functional value as a preservative. Just as salt keeps the integrity of plants and meats intact, so salt was seen to keep the integrity of a body of people together. As a prestige substance that could preserve food through the death of winter and bind people in communal solidarity, salt was highly regarded; during Roman times, salt even became a form of currency, whence our word ‘salary’ (from Latin salārium, ‘salt money’) after the Roman habit of paying soldiers in pieces of compressed salt (hence the phrase: ‘to be worth one’s salt’). Because of its integrating character, salt bridges opposites. Paradoxically, however, the more one attempts to pin salt down in a strictly rational manner, the more the contradictions it embodies abound. The connection of salt to the soul, a balsam to the body, will be explored in more detail when the alchemical contexts of salinity are examined. Its fertilising, generative power, on the other hand, bears obvious comparison to salt’s known capacity to stimulate the growth of the earth—a leavening function extended to the role of the Apostles in the Christian Gospels: ‘Ye are the salt of the earth’. And yet too much salt will make the earth sterile. The understanding of salt as a product of sun and sea, i.e. of fire and water, ouranos and oceanos, touches on its broader esoteric and cosmological implications, not all of which were peculiar to Pythagoras. These aspects become central in alchemy, where, as will be seen, salt acts as the earthly ligature between fire (sun) and water (sea), the arcane substance whose patent ambiguities stem from its role as embodiment and juncture of opposites: purity and impurity, eros and enmity, wetness and desiccation, fertility and sterility, love and strife. One thing that the present discussion of the mythological and historical aspects of salt hopes to emphasise is that none of these ideas are really born of speculation or abstraction; rather, they are all intimately linked to the basic phenomenology of the substance itself. Above all, salt is ambiguous. While some of these ambiguities may be attributed to the unevenness of the sources, and while some points of contradiction may be cleared up upon closer examination (the negative Egyptian views on salt, for instance, mainly seem to apply to times of ritual fasting), this does not eclipse the overarching sense that salt, by its very nature, defies strict definition. Plutarch is referring to a tradition preserved by Hesiod, which will be looked at presently, but before the origin of the ‘brine-born’ goddess is examined, it is worth noting that our own language still preserves this deep association between salt and provocative beauty. Latin sal lies, phonetically and semantically, at the root of words such as salsa and sauce (both meaning ‘salted’), whence the deep connection between sexuality and food implicit in the habit of referring to provocative objects of desire as ‘saucy’ or ‘sassy’ (both derivations of sal). And so the most stimulating flavours—the saltiest, those that make us salivate—are the ones most readily appropriated to express our desire. Tomb of Typhon, Tarquinia, first century BCE. Thus, like the arid red desert and the fertile Nilotic soil, the briny sea was contrasted with the fresh waters of the Nile to oppose the foreign with the familiar, the impure with the pure, and, ultimately, the Sethian with the Osirian. So too, sea salt and rock salt. Interestingly, the premiere substance sympathetic to Seth-Typhon was iron: the metal most drastically corrupted by salt. Moreover, iron and salt-water are the primary constituents of human blood, a microcosmic recapitulation of the primordial salt ocean (mythologically conceived: the cosmogonic waters; evolutionarily conceived: the marine origin of species). Blood is the symbol par excellence for intense passion, and its two poles are love and war, a fact which precisely explains Seth-Typhon’s overwhelming functions in the magical papyri: eros and enmity. Again, it is no surprise that intense sexual attraction (desire, affinity, union) and intense hatred (repulsion, aversion, separation) evoke Empedocles’ principles of ‘Love and Strife’—the very functions governing the unification and separation of the four elements. Moreover, the connection of Seth with redness, blood, eros, war and the like equates with everything that the Indian sages placed under the rubric of rajas, the excited passions, which, as has been seen, are distinctly associated with the stimulating power of salt. Be that as it may, the same divine energeia fed and informed the functions of the Greek and Roman war gods, Ares and Mars, both of whom take the association with iron in the scale of planetary metals, as did Seth-Typhon among the Egyptians. Seth is not only connected to salt, but to the power of the bull’s thigh, the instrument by which the gods are ritually killed and revivified. Here the connection of Seth to the power of the thigh suggests the pivotal role played by this god in the quintessentially alchemical process of death and rebirth, of slaying and nourishment. This theme will be reiterated more than once in the course of this study, and it should be pointed out that any deliberations on this myth are intended as so many historical and phenomenological “circumambulations” around the deep resonances generated by de Lubicz’s emphasis on the role of the fixed femoral salt in palingenesis. More precise chemical definitions specify that a salt is an electrically neutral ionic compound. Here, the same principle of perfect equipoise between opposing energies prevails. Ions are atoms or molecules whose net electrical charge is either positive or negative: either the protons dominate to produce an ion with a positive electric charge (an anion, from Greek ana-, ‘up’), or the electrons dominate to produce an ion with a negative electric charge (a cation, from Greek kata-, ‘down’). When anions and cations bond to form an ionic compound whose electric charges are in equilibrium, they neutralise and the result is called a salt. Although the purview of hieratic alchemy was far wider than mere proto-chemistry, chemical and technical processes were undeniably integral to the alchemists’ savoir-faire. As such it is no surprise to find salts of various kinds figuring in the earliest strata of alchemical writings, East and West. In the Greek “proto-chemical” texts that Marcellin Berthelot brought together under the rubric of alchemy, several different salts are distinguished and listed in the registers alongside the lists of planetary metals and other chemically significant minerals. In addition to salt (halas), one finds common salt (halas koinon) and sal ammoniak (halas amoniakon). More importantly, however, is the significant prefiguration of the tria prima and tetrastoicheia (four element) relationship that is found in Olympiodorus (late fifth century CE). Olympiodorus depicts an ouroboric serpent to which some important symbolic nuances are added. In addition to the usual henadic (unitary) symbolism of this ancient motif, the text displays its serpent with four feet and three ears. The glosses to the image inform us that ‘the four feet are the tetrasōmia’ (the four elemental bodies) while the three ears are ‘volatile spirits’ (aithalai). 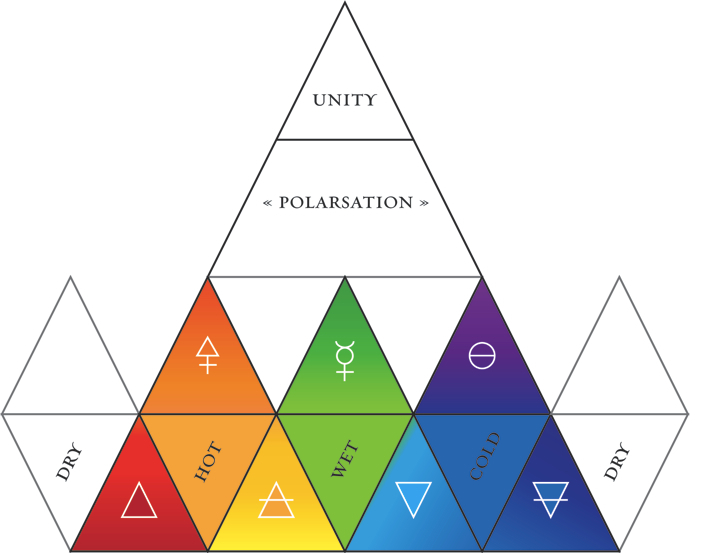 As will be seen in the balance of this study, this relationship of unity to duality, duality to trinity, and trinity to quaternary is pivotal to the Hermetic physics that Schwaller would attempt to convey in terms of an alchemical Farbenlehre (cf. the Pythagorean tetraktys). Ouroboros, Paris MS. 2327 fol. 196. One serpent (ophis), two natures or poisons (iōn: fixed and volatile); three ears (the three volatile spirits); four legs (tetrasōma: the four bodies or elements). The four elemental bodies have been interpreted as lead, copper, tin and iron, (Pb, Cu, Sn, Fe), while the three sublimed vapours have been identified with sulphur, mercury and arsenic (S, Hg, As). Although salt is not included in this depiction, what is significant is that here one finds the exact framework in which salt would later be situated as one of the three principles (tria prima: sulphur, mercury, salt) alongside the four Empedoclean elements (tetrastoicheia: fire, air, water, earth); here salt may be seen to replace arsenic due to its more integral relationship to sulphur and mercury in the form of cinnabar (mercuric sulphide, HgS): the salt of mercury and sulphur. In regards to the metaphysical and cosmological nuances of the symbolism, it may be noted that the three ears are outside the circle while the four legs are inside, a fact that coheres with the view of the trinity as creative and therefore standing outside of creation, while the four elements, being created, are circumscribed within (cf. the distinction in Neoplatonism between hypercosmic and encosmic forces, or in Eastern Orthodox theology between uncreated and created energies). The distinct relation of salt to the body and the elements may account for the cross-like sign it takes in the Greek manuscripts. Signs for Salt, Column Two, Lines 15-20. Marcellin Berthelot, Introduction à l’étude de la chimie des anciens et du moyen âge I, 108. As has been mentioned, the keynote of alchemical precept and praxis pertaining to salt was struck by Theophrastus Bombastus von Hohenheim, alias Paracelsus (1493–1541). Although it is important to recognise that the essential structure of the tria prima was already in place before Paracelsus (indeed, it is inherent to the composition of cinnabar), it is undeniable that the triad of sulphur, mercury and salt is raised by Paracelsus to a previously unparalleled prominence. Of course, Paracelsus was hardly one to follow ancient authorities merely at their word. Indeed, it is imperative to recognise from the start that Paracelsus learnt much of his knowledge about minerals directly from the mines. While Paracelsus travelled widely, he lived and worked chiefly in southern Germany, Austria and Switzerland. If anywhere is to be regarded as “Paracelsus country”, it is the Alpine regions of Salzburg and its surrounds. Now, Salzburg, as its name (‘salt mountain’) attests, has long been the chief source of sodium for the surrounding regions: that is to say, rock salt, mined from the mountains, not sea salt. To this day in Austria and southern Germany common table salt is sold in an iodised form (Jodsalz) because its rock form, which is pure sodium, lacks the beneficial “impurities” that accrue to sea salt (iodine being an essential nutritional mineral). Once again, through its dual nature—preserving and corrupting—a fundamental ambivalence adheres to the reality embodied in salt. And yet, the key to salt resides in its ultimately integrating function. It is the clavis which binds and unbinds, preserves and corrupts. It itself does not undergo the process which it enacts, embodies or disembodies. Importantly, however, as one learns from Schwaller, salt acts as the permanent mineral “memory” of this eternal process of generation and corruption. Salt as the redeeming juncture of opposites is framed by Nietzsche in terms that evoke the themes of autonomous morality expressed in his Jenseits von Gut und Bösen. Running deeper, however, is the surprising link that Nietzsche makes between salt and a desire for eternity that cannot be met through procreation; here one recognises not only the Indo-European ‘path of the fathers’ versus the ‘path of the gods’, but also the two paths in alchemy known as la voie humide and la voie sèche—the wet and the dry ways. Nietzsche taps directly into the crux of the human œuvre. Genetic continuity, i.e. continuity of and through the species, does not satisfy the soul’s desire for eternity; only the desire that is fixed in the salt, deep in the bones, has the capacity to survive biological generation and corruption. Nietzsche’s love for eternity expresses the same reality that Schwaller articulated in terms of the saline nucleus in the femur: the path of eternity, palingenesis and resurrection, hinges not on the chromosomes but upon a fixed mineral salt. In the identification of both sulphur and salt as semence, one discerns a specific coherence of opposites that, in elemental terms, is described by the expression ‘Fire of the Earth’. The salt is described in the passage quoted above as a seed (semence). This seed “becomes” seed again through the process of tree and fruit (growth, ferment, coagulation). It is at once a beginning and a finality (prima and ultima materia). The reality described is non-dual. Beginning and end partake of something that is not describable by an exclusively linear causality; and yet it is seen to “grow” or “develop” along a definite “line” or “path” of cause and effect; at the same time it partakes of a cyclic or self-returning character; and yet, for Schwaller, it is not the circle but the spherical spiral that provides the true image of its reality: a vision which encompasses a punctillar centre, a process of cyclic departure and return from this centre (oscillation), as well as linear “development”, all of which are merely partial descriptors of a more encompassing, and yet more mysterious, reality-process. The fundamental coherence of this vision to the Bewußtwerdungsphänomenologie of Jean Gebser (1905–1973) consolidates the significance of Schwaller’s perception for the ontology of the primordial unity which is at once duality and trinity. For Gebser, consciousness manifests through point-like (vital-magical), polar-cyclic (mythic-psychological) and rectilinear (mental-rational) ontologies, each being a visible crystallisation of the ever-present, invisible and originary ontology which unfolds itself not according to exclusively unitary, cyclic or linear modalities of time and space, but according to its own innate integrum. Thus there is no contradiction in finding the presence of fiery sulphur in the desiccating dryness of the salt, for it is precisely in the one substance that the sulphuric seed (active function) and saline seed (fixed kernel) cohere. The fixed, concrete seed-form (itself a coagulation of mercury by sulphur) contains the active sulphuric functions (the coagulating rhythms) which it will impose upon the nutritive mercurial substance (unformed matter). ‘One nature’, as a Graeco-Egyptian alchemical formula puts it, ‘acts upon itself’. Relationship between Tria Prima and Tetrastoicheia. Trinity (Sulphur-Mercury-Salt) begets quaternary (Fire-Air-Water-Earth). The juncture of Fire and Earth (abstract and concrete) is the means by which the end of the series is linked to its beginning. Diagram after Schwaller and VandenBroeck. In sum, Schwaller’s alchemy is a non-dual spiritual alchemy. What is meant by this is that Lubiczian alchemy is not a dualistic spiritual alchemy that dismisses the physical or physiological aspects of the alchemical tradition as somehow inferior or irrelevant to the purely spiritual aspects of the alchemical purview. In other words, it is not an alchemy that can be subsumed under the dualistic spiritual interpretation of Atwood (which became largely normative in esoteric circles throughout the Nineteenth and Twentieth centuries) or the psychological interpretation of Silberer and Jung, which views the material aspect of alchemy as merely a “screen” for the projection of the soul’s archetypal dramaturgy. Schwaller’s alchemy grows from the milieu of Parisian alchemists surrounding Fulcanelli, who were deeply immersed in the practical, laboratory aspects of the work, but who were ultimately seeking the verification not of material but spiritual processes. The Parisian alchemists of the fin-de-siècle and the early Twentieth century looked not to Atwood (et al. ), but to the texts of Basil Valentine, Nicolas Flamel, and later, Cyliani, as exemplars of the alchemical tradition. For Schwaller, these seemingly bewildering texts not only masked a distinct laboratory process (a fact that has been increasingly recognised by scholars through specific studies of Early Modern alchemists such Newton and Philalethes), but ran deeper still: behind the operative process and the physical manipulations, these texts preserved (and required) a method of perception based on struggle and breakthrough that mirrored the perceptual effort necessitated in the reading of the symbolic language of nature herself (hence the importance of the idea of the liber naturae, the ‘book of nature’ along with its signatura). It was precisely this effort to think according to a deeper symbolic imperative that gave Schwaller the clavis hermeneutica to the text of the Pharaonic temple. While scholars see the idea of a monolithic esoteric, Hermetic or alchemical tradition as historically problematic, merely an identity construct, Schwaller saw the breakthrough to the perception of an actual ontological reality that eludes a purely quantitative epistemology as the true test of a Hermetic adept. For Schwaller, the perception of this reality, at once abstract and concrete, the very bedrock of existence, at once material and spiritual, did not need a historical transmission because it was ever-present, therefore perennially available to human perception. To “discover” this ontological bedrock was equivalent to “finding” the stone, which was seen more as the process underpinning and embodied in materiality per se—the mineral kingdom being regarded as the first material manifestation of spirit—than as a peculiar piece of isolatable matter. For Schwaller it was this fundamental mode of reality-apperception, rather than rigid points of technical or doctrinal exegesis, that formed the true hidden current of continuity within the hermetic tradition, indelibly marking all “good” texts and adepts. But it also had a material application or proof, and this formed the experimentum crucis (and here it should be noted that the term experimentum, in Latin as in French, means both experiment and experience). Alchemy for Schwaller thus centred on a metaphysics of perception but also a material proof that this perception was germane to the very structure of matter and existence as we known it. The idea of the fixed alchemical salt finds its most significant forebears in the concept of the corpus resurrectionis. In this respect, Schwaller is one of the few modern (Western) alchemists to possess what Corbin, in reference to Jaldakī, called a ‘very lucid consciousness of the spiritual finality and of the esoteric sense of the alchemical operation accomplished on sensible species’. This spiritual finality, in the metaphysical purview of Islamic illuminationist theosophy, is no less than the creation of a resurrection body (corpus resurrectionis). In Schwaller’s alchemy one sees very clearly that all the intensifications made on material species occur through an inscription on the entity’s indestructible nucleus (alchemically, a mineral salt); because this nucleus is the foundation of the body, the more intensifications it experiences, the more its essential (primordial but also future) body will approach the perfect equilibrium of an indestructible (and paradoxically, incorporeal) physical vehicle until the point is reached where, ultimately, luminous consciousness itself becomes its own perfect body. Thus, the abstract and the concrete, the volatile and the fixed, are ultimately conjoined through a process of intensification registered permanently in the being’s incorruptible aspect—the salt in the bones or ashes (cf. the Hebrew luz or os sacrum). 1. Commentary on the Hikma al-‘arshīya, 187, 227; Henry Corbin, Spiritual Body and Celestial Earth (Princeton, New Jersey: Princeton University Press, 1977), 102-3. 2. Gerhard Dorn (fl. 1566-1584), ‘Speculativae philosophiae, gradus septem vel decem continens’, in Theatrum Chemicum (Strassbourg: 1602-61), 307; Johan Christoph Steeb, Coelum Sephiroticum Hebraeorum (Mainz, 1679), 29: ‘sal sit ultimum in corruptione, sed & primum in generatione’; De Lubicz reformulates the bivalence of the alchemical salt in terms of ‘a ligature of concreteness and abstraction’. 3. Diogenes Laertius, VIII, 35. 4. Margaret Visser, Much Depends on Dinner: The Extraordinary History and Mythology, Allure and Obsessions, Perils and Taboos, of an Ordinary Meal (Toronto, Ont. : McClelland and Stewart, 1986), 75. 5. G. Tucker, Etymological Dictionary of Latin (Chicago: Ares, 1976), 212. 8. Although attributed to Aristotle, the phrase natura non facit saltum comes from Carl Linnaeus’s Philosophia Botanica (1751); Linnaeus’s expression itself is a Latin rendering of a French expression from the preface to Gottfried Leibniz’s Nouveaux essais sur l'entendement humain (1703): ‘La nature ne fait jamais des sauts’ (‘nature never makes a leap’); it continues in the idea of phyletic gradualism versus punctuated equilibrium in evolutionary theory. 9. Victor Hehn, Das Salz: Eine kulturhistorische Studie (Berlin, 1873); Matthias Jacob Schleiden, Das Salz: Seine Geschichte, seine Symbolik und seine Bedeutung im Menschenleben: Eine monographische Skizze (Leipzig, 1875; Weinheim, 1983); Jean-François Bergier, Une Histoire du sel (Fribourg: Office du Livre, 1982); S. A. M. Adshead, Salt and Civilizaton (New York: St. Martins, 1992); Pierre Laszlo, Salt: Grain of Life, trans. Mary Beth Mader (New York, 2001 = Chemins et savoirs du sel, 1998); Mark Kurlansky, Salt: A World History (London: Vintage, 2003). 11. William J. Darby, Paul Ghalioungui, Louis Grivetti, Food: The Gift of Osiris (London: Academic Press, 1977) I, 444, though cf. evidence and remarks at 445. 12. Cf. Meneely et al. (1957) cited in Darby et al., Food: The Gift of Osiris, I, 447. 13. Adshead, Salt and Civilization, 24. 14. Darby et al., Food: The Gift of Osiris, I, 444; cf. Michael Lattke, ‘Salze der Freundschaft in Mk 9 50c’, Zeitschrift f. d. neutest. Wissenschaft, 75 (1984); Visser, 76. 15. Pliny, Nat. Hist., xxxi, 88, 89; the Codex Justiniani, lib., xxxix, iv, 11, makes it illicit ‘to sell to the enemy the whetstone to sharpen iron; as well as iron, wheat or salt’. 16. Plutarch, Table Talk, IV (4) 3; V (10) 4; trans. Edmund O von Lippman, ‘Chemical and Technical References in Plutarch’, Ambix 3.1-2 (1948): 7. 17. Plutarch, Table Talk, IV (4) 3; V (10) 4; (Lippman, 7). 18. Plutarch, Table Talk, IV, 10, 685. 19. Luke 14:34; Mark 9:49; Matthew 5:13. 20. Leviticus 2:3; cf. Ezekiel 43:24; Ezra 6:9, 21-2; 4:14; Homeric poems do not mention the addition of salt in sacrifices; cf. the explanation in Athenaeus, Deipnos., XIV, 23, 661; Darby et al., Food: The Gift of Osiris, I, 443. 21. Athenaeus, Deipnos., XIV, 23, 661. 22. Egyptian: hmat, Coptic: hmou; Rolf Gundlach, ‘Salz’, Lexikon der Ägyptologie 5, cols 371-374; Rock salt deposits known in Siwa: Pliny, Nat. Hist., XXXI, 39; Strabo I, 3, 4, ch. 49; Arrian, Anabasis Alexandri, III, 4, 3-4; Herodotus IV, 181-185. 23. Plutarch, Iside et Osiride, 363, 32. 24. Plutarch, Table Talk, IV, 10, 684-5. 25. Diogenes Laertus, VIII, 35. 26. Cf. Tacitus, Annals, XIII, 57, remarking on the Hermunduri and the Chatti: ‘It is they think through the bounties of divine power, that in that river and in these forests salt is produced not as in other countries by the drying up of an overflow of the sea […] but by a combination of two opposite elements, fire and water’. 27. Traditional Chinese Medicine and Ayurveda, for instance, both prescribe salt as a digestive stimulant. 28. Plutarch, Iside et Osiride, 352, 5: ‘[The Egyptian priests] use no salt with their food during their periods of holy living, [because salt] by sharpening their appetite, makes them more inclined to drinking and eating’. 29. Plutarch, Table Talk, IV, 10, 684-5. 30. Plutarch, Table Talk, IV, 10, 684-5. 31. Empedocles, fragment 17 (Simplicius, in Phys. 158, 1); Kirk, Raven, Schofield, 287. 32. Theogony, 189-200; H.G. Evelyn-White, trans. Hesiod, Homeric Hymns, Epic Cycle, Homerica, Loeb Classical Library Volume 57 (London: William Heinemann, 1914). 33. Aphrodite took the bi-name Cypris from the island Cyrprus, the ancient cult centre of the Sumerian goddess Ishtar (= Inanna = Astarte). 35. Heraclitus, fragment 61 (= Hippolytus Ref. Ix, 10.5); trans. Kirk-Raven-Schofield, 188. 36. Plutarch, De Iside et Osiride, ch. 32 (363). 37. Plutarch, De Iside et Osiride, ch. 32 (363). 38. Plutarch, De Iside et Osiride, ch. 32 (363), with further remarks and citations in Darby, et al., Food: The Gift of Osiris, I, 447. 39. Siwa was the locus of the Egyptian oracle that affirmed Alexander the Great as ‘Son of Zeus-Amun’. 40. Arrian, Anabasis Alexandri, III, 4. 3-4. 41. PGM VII. 374-6; PGM VII. 467-77. 42. Cf. Homeric Hymn to Poseidon (hymn 22); Orphic Hymn to Poseidon (hymn 17); Aelian, On Animals, 12. 45; PGM, passim (spells to Typhon). 43. In the Rig Veda, cf. Rudra, ‘the red one’. 44. F. Sherwood Taylor, Inorganic and Theoretical Chemistry (London: William Heineman, 1944), 194. 45. William B. Jensen, ‘The Origin of the Term “Base”’, The Journal of Chemical Education 83, 8 (2006): 1130; Mark Kurlansky, Salt: A World History (London: Vintage, 2003), 300. Cf. the contemporary definition in N. Lemery, Cours de chymie (ed. Theodore Baron d’Henouville, Paris, 1675; reprinted 1756), 733-4: ‘The acid is always a solvent, when it is put in large enough quantity on the matter which we wish to dissolve; but it always makes a Coagulum, when as it is in too small a quantity its points have got stuck in the pores of the matter, and are far from having the strength to separate it in order to come out of it; this is what is seen when we pour some spirit of vitriol on liquor of salt of tartar; for if we put on only what is necessary to penetrate the salt, the acid points remain as if sheathed and they weigh down the body, which is why a coagulation and precipitation occur; but if we add to the liquor as much again of the spirit of vitriol as we had put on to it, or more, the Coagulum will disappear, because the little bodies, which when assembled together were holding up the acid and preventing its movements, will be separated and dissolved by the acid which has become stronger’. 47. Here, metal provides the cation, oxygen the anion. 48. Berthelot, CAAG, 108-9. Note also alums (styptikon). 49. Paris MS. 2327 fol. 196. 50. Joseph Needham, Lu Gwei-djen, Nathan Sivin, Science and Civilisation in China, vol. 5. part 4: Spagyrical Discovery and Invention: Apparatus and Theory (Cambridge: Cambridge University Press, 1980), 375. 51. It should be noted that the trinitarian conception mentioned here precedes Christian theology; it is notably significant in Egyptian theology and Pythagorean metaphysics. 52. J. Ruska, Das Buch der Alaune und Salze: Ein Grundwerk der spätlateinischen Alchemie (Berlin: Verlag Chemie, 1935). 53. Gabriele Ferrario, ‘Origins and Transmission of the Liber de aluminibus et salibus’, in Lawrence M. Principe, ed., Chymists and Chymistry: Studies in the History of Alchemy and Early Modern Chemistry (Sagamore Beach, MA: Science History Publications, 2007), 140. 54. Ar-Razi, as Eberly points out, must not be confused with other well-known Razis, such as Najm al-Din Razi; one must also be cognisant of the fact that the name bore more than one western transliteration (e.g. Rhazes and Rhasis). 55. John Eberly, Al-Kimia: The Mystical Islamic Essence of the Sacred Art of Alchemy (Hillsdale, NY: Sophia Perennis, 2004), 27-9; Bernard D. Haage, ‘Alchemy II: Antiquity–12th Century’, DGWE, 29. 57. Cf. texts adduced in Jung, Mysterium Conjunctionis, in The Collected Works of C. G. Jung, vol. ? (trans. R. F. C. Hull, Princeton, N.J.: Princeton University Press, 1968), 188 ff. 59. Rosarium philosophorum, Art. Aurif., II, 210. 61. Ros. phil., 222: ‘the root of the art is the soap of the sages’. On salt as soap (and also bitter), cf. the Egyptian use of natron. 62. Ros. phil., 225. Jung points in this connection to the Aurora Consurgens, 141, where the bride calls herself the ‘key’ (clavicula). 63. ‘Gloria mundi’, Museum Hermeticum, 216 (= Waite, I, 177); Jung, Mysterium, 190. 64. Joh. Christophi Steeb, Coelum Sephiroticum Hebreaorum, 29. 65. Waite ed., I, 258-9. 66. Cf. Paracelsus, ‘Concerning the Nature of Things’ (Waite ed. I, 125): ‘For Mercury is the spirit, Sulphur is the soul, and Salt is the body’. 67. Paracelsus, Theologische und religionsphilosophische Schriften, ed. Kurt Goldammer (Wiesbaden and Stuttgart: Steiner, 1955), 63. 68. Temple, vol. I, 67; Al-Kemi, 186. Emphasis added. 69. Paracelsus, Hermetic and Alchemical Writings, ed. A. E. Waite (Edmonds, WA: The Alchemical Press, 1992), 98 = The Economy of Minerals, Ch. 9: ‘Concerning the Virtues and Properties of Salts in Alchemy and in Medicine’. 70. Natron was used in Egypt for its cleansing properties and imported by the Greeks for the same purpose. See Robert K. Ritner, ‘Innovations and Adaptations in Ancient Egyptian Medicine’, JNES 59, 2 (2000), 116 with n. 55; Warren Dawson, ‘A Strange Drug’, Aegyptus 12, 1932, 12-15. 71. The corrupting reaction to oxygen that often forms the salts of metals is usually poisonous; its colour, however, was considered the ‘flower’ of the metal; the specific colour of this flower was understood as a vital signature of the metal’s spirit. 72. Basil Valentine, Zwölf Schlüßel, ed. Tanckius, vol. II, 657-8: ‘Gleich wie das Saltz ist eine Erhalterin aller Ding / und bewahret für der Fäule / Also ist das Saltz unserer Meister auch ein Schutz der Metallen / daß sie nicht können gar zu nichte gemacht und verderbet werden / daß nicht wieder etwas darauß werden solte / es sterbe dann ihr Balsam / und eingeleibter Saltz-Geist von Natur ab / als denn wer der Leib todt / und könte nichts fruchtbarliches weiter darauß gemacht werden / Denn die Geister der Metallen werden abgewichen / und nur durch natürliches Absterben eine leere todte Wohnung verlassen / darinnen kein Leben wieder zu bringen’. 73. Lawrence M. Principe and Andrew Weeks, ‘Jacob Boehme’s Divine Substance Salitter: Its Nature, Origin, and Relationship to Seventeenth Century Scientific Theories’, The British Journal for the History of Science 22, 1 (1989): 53-61; Paracelsus (Waite ed. ), I, 263. 74. Georg von Welling, Opus Mago-Cabbalisticum et Theosophicum: Der Ursprung, Natur, Eigenschaften und Gebrauch des Saltzes, Schwefels und Mercurii, Andre Auflage (Frankfurt und Leipzig: in der Fleischerischen Buchhandlung, 1760), 2 (I, § 3), 40 (II, § 1): ‘Droben ist § 3. gesagt worden, daß des gemeinen [Salz] Figur (1) sey cubisch, die da ist eine Figur der irdischen Cörper, und diese Eigenschaft habe es im Durchstreichen der Erde bekommen. In eben demselben §. wird gesagt, (2) seine Form sey diaphan oder durchscheinend, gleich dem Glas. (3) Das es sey güssig und flüssig, und alle Cörper ganz leichte durchgehe. (4) Sein Geschmack seye sauer, und ein wenig zusammenziehend; (5) Es sey austrocknender Natur und Eigenschaft; (6) Kühlend; Und (7) daß es in seinem Innersten sey ein wesentliches Feuer’. 75. Glenn Alexander Magee, Hegel and the Hermetic Tradition (Ithaca, NY: Cornell University Press, 2001), 209, citing Georg Wilhelm Friedrich Hegel, Philosophy of Nature, § 316 = M. J. Petry, trans. Hegel’s Philosophy of Nature, 3 vols. (London: George Allen and Unwin, 1970), vol. 2, 117; cf. also Magee, Hegel Dictionary, 58-60. 77. Schwaller, ‘Le monde de la trinité’, Notes et Propos inédits, I, 64: ‘L’Unité se manifeste comme Trinité. Celle-ci est «créatrice» de la forme, mais non encore forme elle-même, laquelle va apparaître par le mouvement, c’est-à-dire Temps dans l’Espace’. 78. Schwaller, ‘Le monde de la trinité’, Notes et propos inédits, I, 65-6: ‘La Trinité , c’est-à-dire les Trois Principes, sont la base de tout raisonnement, c’est pourquoi dans toute «chaîne de genèse» il faut avant tout établir la Triade de base qui sera le Triade particulière. Elle comprend toujours d’abord une donnée abstraite ou nourricière, une donnée de mesure, de rhythmisation, de fixation et, finalement, une donnée concrète ou fixée comme semence. C’est ce que les philosophes hermétiques ont transcrit concrètement, symboliquement, par Mercure, Soufre et Sel, jouant sur l’apparence métallique où le Mercure métallique joue le rôle du substance nourricière, le Soufre étant coagulant de ce Mercure, le Sel est le produit fixe de cette fonction. En généralisant: tout dans la Nature étant Espèce formée, sera Sel: tout ce qui coagule une nourriture sera Soufre ou de nature de Soufre, depuis le chromosome jusqu’au caillé du lait. Tout ce qui es coagulable sera Mercure, quelle que soit sa forme’. 79. On the development of the idea of salt as neutralisation reaction between an acid and a base in chemistry and alchemy, see the numerous texts and contexts cited in A. M. Duncan, ‘Styles of Language and Modes of Chemical Thought’, Ambix 28, 2 (1981): passim (83-107). 80. Temple, I, 77-8/I, 42: ‘En biologie le grand mystère est l’existence, chez tout être vivant, de l’albumine ou des matières albuminoïdes (protéïniques). L’une des substances albuminoïdes est coagulable à la chaleur (le blanc d’œuf en est le type), l’autre ne l’est pas. Le type de cette dernière est la substance albuminoïde portant le spermatozoaire. Le sperme albumonoïde ne peut pas être coagulable puisqu’il porte le spermatozoaire coagulant la substance albumonoïde de l’ovule féminin. Dès qu’un des spermatozoïdes a pénétré l’ovule, celui-ci se coagule à sa surface et empêche toute autre pénétration: la fécondation a eu lieu. [Cette impénétrabilité n’est pas en réalité provoquée par un obstacle matériel, la coque solide, mais par le fait que deux polarités énergétiques égales se repoussent.] Le spermatozoaire joue donc le rôle d’un feu « coagulant vital » comme le feu vulgaire coagule l’albumine féminine. C’est l’action d’un feu masculin en un milieu passif, froid, féminin. Il y a toujours encore, ici, des porteurs matériels de ces énergies, mais ils manifestent l’existence d’une énergie à l’aspect mâle actif, et d’un aspect féminin passif qui subit. Le feu ordinaire coagule brutalement le blanc d’œuf, mais le spermatozoaire le coagule doucement en le spécifiant en embryon de son espèce. Ceci est une image qui montre que la virtualité de la semence passe à l’effet défini à travers la coagulation d’une substance passive, semblable à l’action d’un liquide acide en un liquide alcalin formant un sel défini. Or le spermatozoaire, pas plus que l’albumine mâle, n’est acide, mais il joue animalement le même rôle; le feu ordinaire n’est ni mâle ni acide, il est pourtant le type de l’action mâle et acide. Ceci, et d’autres considérations, incitent le philosophe à parler d’une Activité positive, acide, coagulante, sans porteur matériel, et d’une Passivité, substance négative, alcaline, coagulable, également sans caractère matériel. De leur interaction résulte le première coagulation encore non spécifiée, l’Unité ternaire, aussi appelée le « Verbe créateur » parce que le Verbe, en tant que parole, ne signifie que le Nom, c’est-à-dire la définition de la spécificité des choses’ (trans. modified). 81. Schwaller, ‘Le monde de la trinité’, Notes et propos inédits, I, 66: ‘En géométrie, dans un triangle, la ligne donnée est Mercure, les Angles sont Soufre, le triangle qui en résulte est Sel’. 82. Schwaller, ‘La semence’, Notes et propos inédits, I, 44: ‘Il ne peut alors s’agir que d’un Feu actif, c’est-à-dire d’une « intensité » séminale, comme le « feu » du poivre, par exemple, ou bien le « feu » d’un ferment organique, ou bien d’une ferment catalyseur. Le caractère de tous les ferments, c’est-à-dire des semences, étant de déterminer en Temps et Espace une nourriture—en principe sans forme—, c’est donc nettement un rôle coagulant. La coagulation de tous le « sangs » étant précisément leur fixation en forme de l’espèce de la semence coagulante, la coagulation étant, par ailleurs, un changement d’un élément aquatique en élément terrestre ou solide, sans dessèchement, sans addition ou diminution de composants’. 84. Iamblichus, De Mysteriis, 81, 13-82.2; trans. Shaw, 220. 85. Cf., most notably, the resurrection theology of the Gospel of Paul, the Shaikhī school in Iranian Sufism, and the diamond body of Vajrayana Buddhism. 86. Henry Corbin, ‘Le « Livre des sept Statues » d’Apollonios de Tyane, commenté par Jaldakī’, Alchimie comme art hiératique, ed. Pierre Lory (Paris: L’Herne, 1986), 67-8: « Ses nombreux ouvrages se signalent par sa conscience très lucide de la finalité spirituelle et du sens ésotérique de l’opération alchimique accomplie sur des espèces sensibles ». 87. Saint Gregory the Sinaite, ‘Chapters on Commandments and Dogmas’, trans. Seraphim Rose, Genesis, Creation and Early Man (= Philokalia, Russian, vol. 5; English, vol. 4). 88. Robert Avens, ‘Re-Visioning Resurrection: St. Paul and Swedenborg’, Journal of Religion and Health 23, 4 (1984): 302-3. 89. Gregory of Nyssa, ‘On the Soul and Resurrection’; Nicene & Post Nicene Fathers V: Gregory of Nyssa: Dogmatic Treatises, etc., 464. 90. C. F. D. Moule, ‘St. Paul and Dualism: The Pauline Conception of Resurrection’, New Testament Studies 12, (1966): 109; cf. also P. W. Gooch, ‘On the Disembodied Resurrected Persons: A Study in the Logic of Christian Eschatology’, Religious Studies 17, 199-213.